Amalia Pica is a contemporary artist whose work includes drawings, sculptures, large-scale photographic prints, slide projections, live performances, and installations. 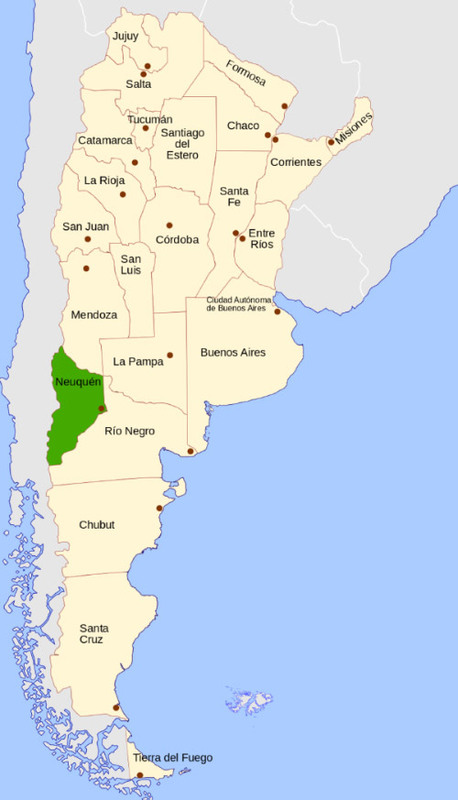 Pica was born in Argentina during the “Dirty War” (1976–1983), a period when the country was ruled by a military junta that imprisoned and murdered tens of thousands of people suspected of political dissent. Many people were “disappeared”—seized by the authorities and never heard from again. This historical context provides a starting point for understanding Pica’s work, which explores issues of communication, civic participation, and the limits and failure of speech. Procession (Reconfiguration), Pica’s installation at the Portland Art Museum, evokes this moment of openness and possibility. The work combines the forms of placards with the festive decoration of bunting to suggest the ritualized action of public demonstrations. The signs depict a spirited arrangement of colors rather than the slogans we might expect to see. The alignment suggests a moment of serendipity in the noise of a protest. Pica’s art often centers on a wordless moment, a pause pregnant with the potential for declaration, yet remaining suspended in silence. Colors and shapes become important symbols in this quiet realm, substituting a visual chromatic language for the audible assertion of words. Amalia Pica lives and works in London. Amalia Pica provided the Portland Art Museum with directions on how to install Procession (Reconfiguration) correctly. She specified the order of the placards, the distances between them, and their proximity to the wall. Why do you think Pica decided to create the work in this form: 11 separate placards, attached to wood rods, leaning against a wall? How would the work have a different effect if it were painted on one piece of canvas? How might the meaning of the work change if you rearranged the placards or placed the triangles in different positions on the placards? Imagine Procession (Reconfiguration) as a performance piece. How would you direct people to interact with the placards? What movements would you choreograph for them? 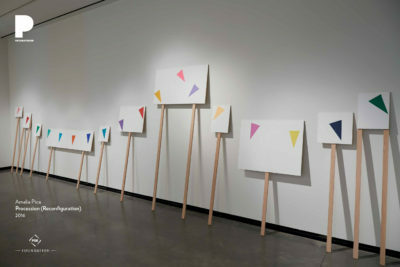 In Procession (Reconfiguration), Pica painted colorful triangles on paper in an arrangement that suggests bunting–fabric flags attached to string. She incorporates bunting into other works, such as the performance piece Strangers (2008) in which two people who have never met before hold a string of bunting for hours at a time. The act of holding the string off the floor prevents them from moving close enough to talk comfortably, yet keeps them in a constant relationship with each other. Try a variation on this performance by asking two students to hold a length of string or bunting about 30 feet long. Do the students communicate with each other? If so, how? How do other students respond to the two holding the string? Ask students to write descriptions and reflections on the experience afterwards. Create a work of art by repeating a simple, geometric shape in any materials you choose. Does your work remain purely abstract or does it refer to external reality in some way? Ask for other people’s perspectives. What do they see or think of when they look at your work? Artist quotations are from Joao Ribas and Julie Rodrigues Widholm, Amalia Pica (Chicago: Museum of Contemporary Art Chicago, MIT List Visual Arts Center, and ARTBOOK, 2013). 16. Amalia Pica. The Guggenheim Museum. Courtney Fiske, Playing Telephone: An Interview with Amalia Pica, Art in America (April 12, 2013).